One of the greatest thrills in the game of basketball is seeing the ball go through the net. To become a good shooter, a player must develop proper shooting mechanics. Square up shoulders to the basket. Ball on fingertips, not palms. Opposite hand should be lightly placed on side of ball (balance/weak hand). A player should practice BEEF principles, as follows. Balance: Learn to prepare for the shot by stopping with the feet set, knees slightly bent, ready to jump (good triple threat position). Elbow: Proper shooting alignment; ball should be directly over the elbow with the wrist cocked. Eyes: Pick a spot (front of the rim, back of the rim, etc.) and focus on that target as the shot is being attempted. Follow through: Release the ball smoothly, completely extend the arm, and snap the wrist down and slightly outwards with view of thumb going into the basket, which should create good backspin on the basketball and a nice soft shot. A coach should allow at least five repetitions before rotating. Pair up players and have them spread out, approximately six to eight feet apart. One player in each pair will get down on the floor (shooter), and lie on their back. Instruct your shooters to place their shooting elbow on the floor and against their body. Shooting hand should be spread wide. The shooter’s balance/weak hand should not touch the basketball. The non-shooting partner will place the basketball on the shooter’s hand. 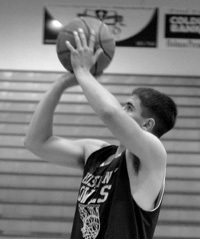 As the basketball is shot, shooters should focus on a full extension and proper follow through, creating good backspin. If coaching kindergarten through second-grade players, you should allow the shooters to use their balance/weak hand. If coaching older players, they can do this drill by themselves. Lay on the floor and with proper shooting mechanics, shoot the ball into the air and catch it when it comes straight back down. Work on the follow through and see the proper follow through provide a soft shot with backspin. The purpose of this drill is to encourage proper shooting mechanics by shooting close to the basket. Three players can perform this drill at the same time. Form three lines, as those waiting their turn can mimic proper shooting techniques. Allow at least five repetitions before rotating. 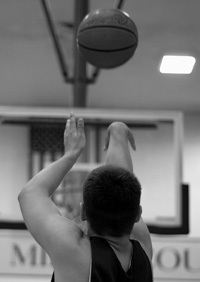 The first three shooters in line will spread out around the basket, no farther than two to three feet from the basket. Shooters should assume triple threat position and have eyes on the target. Each shooter will position the basketball correctly using only one hand (their shooting/strong hand), with the ball directly over the elbow and wrist cocked. When shooting, players should hold their follow-through for two to three seconds. Allow shooters to add their balance/weak hand. Three players can do this drill at one time. Emphasize “ball in air/feet in air” concept, good pivot and “square up,” and following the shot. Allow players to shoot for one minute before rotating out. Spread three players out around the basket, with their backs facing the basket. Have players toss the ball in front of them to simulate a pass (show them how to pass it to themselves with backspin). Players will receive the pass, reverse pivot toward the goal, and shoot. Players will rebound their own shot and repeat process. Instruct your players to shout “STEP-HOP-SHOOT” when performing this drill. Mirror this drill to practice left-handed lay-ups. Allow players to spread out in your practice area, at least four to five feet apart. Players start in triple threat position, holding imaginary basketballs with heads and eyes up on the target. On the STEP command, players step with their left foot (right-handed lay-ups). On the HOP command, players raise their right knee and right arm toward the basket (visualize a string connecting a player’s right arm and right leg). On the SHOOT command, players extend their right arm as they shoot an imaginary ball. Two pair of players can do this drill at one time. Allow pairs to shoot 30-45 seconds before rotating out. One player in each pair will shoot and follow their shot. After securing the rebound, the shooter will pass to their moving partner (moving with a purpose, not running aimlessly). Partner shoots, follows their shot, and repeats the process. Shooter must score on a put-back before passing to their partner. The coach could also allow shot fakes and one to two dribbles that go somewhere. This drill is best suited for fifth- and sixth-grade players. Two groups of three can do this drill at the same time. You will need two basketballs per group. Allow the shooters 30 seconds before rotating. Each player in the group of three will rotate from shooter to rebounder to passer. Shooter starts at wing area (about 8-10 feet from goal). Shooter makes a V-cut to the block area and explodes back up to wing area for a short bank shot. Shooter should show passer a hand target. Passer makes a good two-hand chest pass to shooter. Shooter pivots, “squares up,” and shoots the basketball. Rebounder secures each shot and passes the basketball to the passer. This cycle is repeated over and over until time is called. A great V-cut requires a change of pace. The shooter should go half-speed toward the block and full-speed back up to the wing area. The two line shooting drills incorporate the following fundamental skills of basketball: shooting, dribbling, rebounding, footwork, passing, and receiving. Players rotate lines after each turn. After several repetitions shooting from one side of the goal, change the designation of both lines and shoot from the other side of the court. Players form two lines opposite the goal in each corner of the practice area: a shooting line and a rebounding line (use cones or chairs to mark a starting point) . Shooting line: Assume triple threat position, showing ready hands to receive a pass. Rebounding line: Players should block out an imaginary defender and rebound the ball above their head. The player from the rebounding line secures the rebound and dribbles to a designated cone, makes a good jump stop landing in triple threat position, and uses proper passing techniques when passing to the next shooter in line. 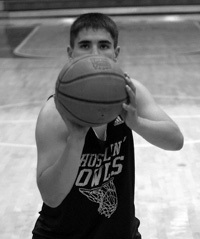 Shooter receives the basketball and performs the drill as instructed by a coach. Stress jumping off the proper foot and using the backboard (STEP-HOP-SHOOT). Set a cone at desired shooting spot (stress good jump stop and use of backboard when shooting from appropriate angle). Two lines: a dribbling/passing line and a shooting line. Set a cone at desired spot for the dribbling player to perform a jump stop and pass to the moving shooter. Set a cone at desired shooting spot. Dribbler should use different dribbling moves to get by imaginary defender (crossover, whirl pivot, behind the back). Shooter should cut to shooting spot, receive the pass, and shoot a 5-10 foot jumper (no dribble). Shooter rebounds their own shot. Shooter dribbles to a specific cone, jump stops, and passes to the next player in line. If a shot is missed, players should keep rebounding and shooting until a basket is made. For third- through sixth-grade teams, consider adding a second basketball. This is a great shooting drill that allows lots of shooting opportunities. Use cones or chairs to represent desired shooting spots. Emphasize the following: hard cuts and “selling” the fake, proper receiving techniques, good footwork to “square up” to the basket, proper shooting mechanics, and following the shot. Players form two shooting lines under the goal at the free-throw lane extended (behind baseline). One basketball in each line. A coach stands 10-15 feet away, facing the goal and shooting lines. A player in one of the lines will pass to the coach and make the instructed cut to a specific shooting spot. A coach will pass the basketball to the player who will catch and shoot (after a coach passes to a player in one line, the player in the other line repeats the process). Shooters will rebound their own shots and give the basketballs to the next players in the lines. Baseline/Corner Spot: Players take two to three short steps from block area to center of lane area (under the basket) before making a hard V-cut parallel to the baseline. Player receives the pass for a short baseline jumper. Wing Spot: Players take two to three steps from block area to center of lane area (under basket) before making a hard V-cut to wing area. Player receives the pass for a short bank-shot. Elbow Spot: MOVE the two lines opposite the goal in each corner of the practice area (same as two line shooting drills), with a coach standing between the two lines. A player will pass the basketball to a coach and take three to four steps straight toward the baseline before making a hard V-cut to the free-throw line extended. Player receives the pass for a short elbow-jumper. Allow a shot fake and one to two dribbles that go somewhere before the shot. This is a great drill to keep idle players busy while running a drill on the court that may not involve your entire team. Player stands about four to five feet away from the wall. Help the player find a reasonable shooting target on the wall. Player assumes triple threat position. Player shoots the ball at the target, concentrating on elbow in and full extension. Player should finish the shot up on his or her toes with proper follow through, creating good backspin. If coaching third- through sixth-grade players, allow them to shoot using only their shooting/strong hand.